With our family from South Africa here for a visit, I hadn't the time to feed Khye his first solid until about 1 week after he reached 6 months old. 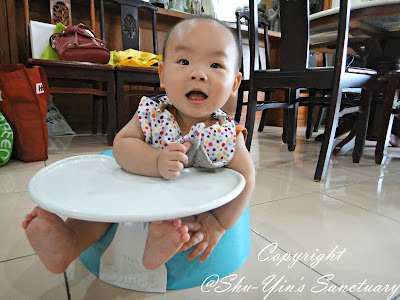 But unlike his big bro's time, Khye is NOT ready for solids, or should I say semi-solids at 6 months! I cooked the homemade wholesome rice cereal recipe for Khye, just like I did for Shern. But it is not the taste that Khye did not like. He is just not ready! 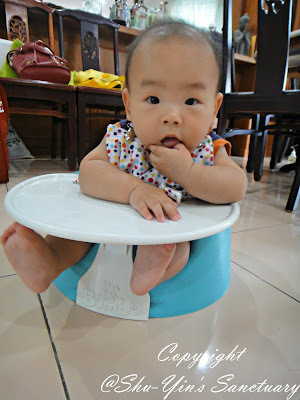 Look at him, sitting happily on his Bumbo seat while I was getting his food ready. Put the large bib on him, and he sucked his fingers as usual. But as I fed him the cereal, he GAGGED, and SPAT it out. He made a crying sound which tells me "NO"! As I continued to try again, he made his crying face indicating that he didn't like it. Look at my poor baby. He then gagged on the food a few times, which led to PROJECTILE VOMIT, and out came his milk from the tummy! I stopped feeding him then, and he was his happy self once again! Sigh. I tried again a few days later, and the same thing happened. He gagged, spat it out, and then projectile vomit. Arghhhh....he is SO NOT READY! 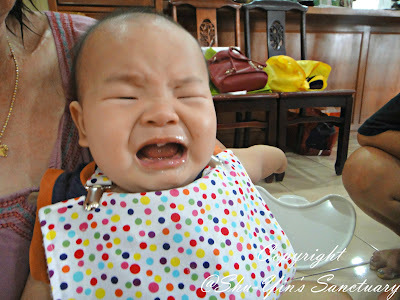 I then learned that he is those one of those babies who is still not ready for semi-solids at 6 months old. He still has the sensitive gag reflux, which all babies have to prevent them from choking when they stuff things into their mouth. 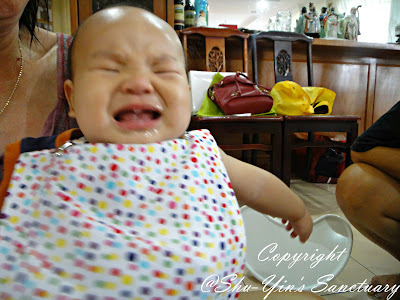 But most babies gag reflux reduces as they grow bigger, but clearly not Khye's. 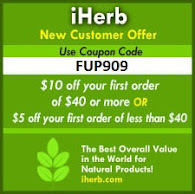 I tried with other food, other diluted purees but no to avail. From the way I see it, it is not the taste that he does not like, it is the food that he does not like. He does not like to push the food to the back of his mouth to swallow. His sensitive gag reflux pushes the food out. Doc said it is ok. 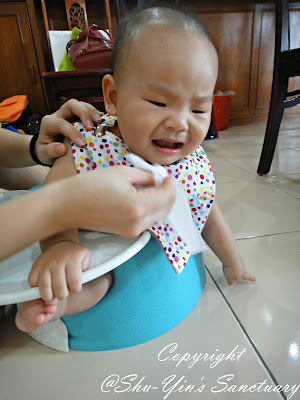 Some babies need more time before they are ready for semi-solids. Some babies are only ready at 9 months or even a year old! Oh gosh, I hope Khye is not one of those babies. Look at my poor little cutie pie. 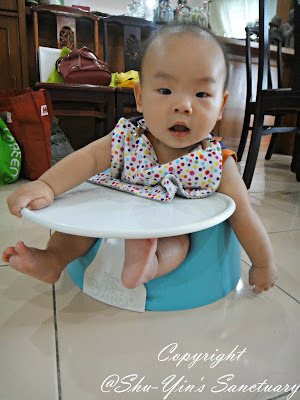 This video is taken when Khye was about 6 1/2 mths old. Luckily Khye is still gaining weight. He gains only 300g though, and is 9.6kg @ 7 mths. Doc said babies usually don't gain so much after 6 mths, so is normal. Oh dear! So drama! But appearance wise, he doesn’t look to be lacking in any nutrition. So the milk supply must be still going pretty well. Nice bib, btw ;) Good to see the fit looks just right.